Weary of her ordinary life in ordinary Smithwell, Maine, Kate Brewer jumps at the chance to help an elderly neighbor, Ray Landry, investigate an unsolved murder. But Ray’s memories of the killing are at odds with the official report, and most people in town would rather forget about the tragic event. When Ray’s investigation turn deadly, past and present collide and Kate must act quickly to uncover the truth. As Kate hunts for clues, she makes a discovery that will change her life forever. 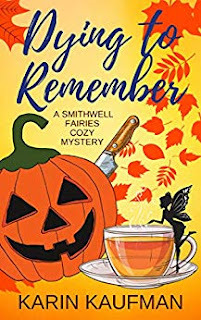 It seems that Ray’s talk about fairies in the woods of Smithwell was more than just talk—and reality isn’t quite the ordinary thing Kate imagined it to be. Can she and her new sleuthing partner, a determined little fairy named Minette, solve two murder cases before a third body shows up?